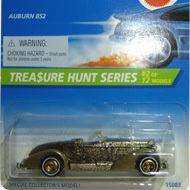 3/12 from the 1996 Treasure Hunt series. The Ferrari has metallic grey paint with a red stripe on the hood and trunk. 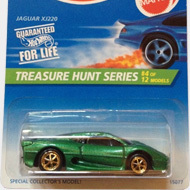 It has clear windows, a red interior, Real Rider tires with chrome rims, and a grey Malaysia base. The 250 made its debut in 1991 and is based upon the race cars built from 1953 to 1964. 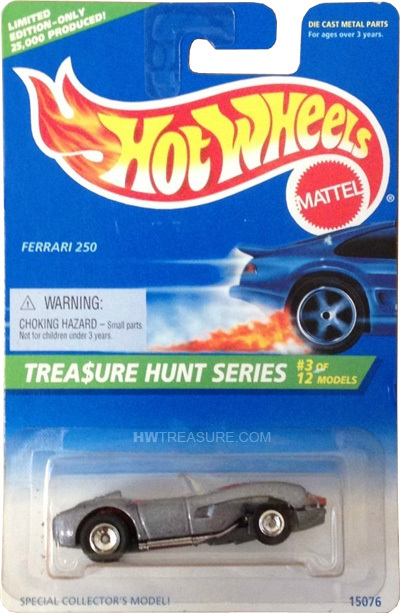 It is not the only Ferrari T-Hunt in 1996. The 355 is also part of the set.